No fewer than five different polls conducted during the last months of the 2008 presidential campaign found the public strongly believed that the news media was biased in favor of Democrat Barack Obama in his campaign against Republican John McCain. In July, a Rasmussen poll found more than three times as many voters saw journalists favoring Obama; by October, a Pew Research Center poll discovered the margin had grown to nearly 8-to-1. A Sacred Heart University national poll of 800 voters released in August 2008 found 'more than two-thirds of Americans included in this poll, 67.9%, believed U.S. Senator Barack Obama is receiving the most favorable coverage,' compared to 'just 11.1%' who said McCain was getting better press treatment. Just under two-thirds (64.9%) say the media'love affair' with Obama was either very real (30.5%) or somewhat real (34.4%). The October 22 Pew poll also found: 'In recent presidential campaigns, voters repeatedly have said they thought journalists favored the Democratic candidate over the Republican. But this year's margin is particularly wide.' 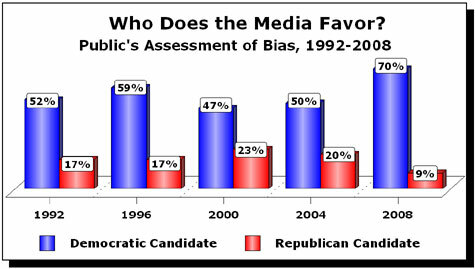 Data from 1992 through 2004 showed much more balanced public assessments of the media's fairness in those presidential campaigns.